Pulitzer-winning photographer Bill Frakes has traveled around the world, but he loves his native Nebraska best. Photo courtesy of Andrew Hancock. I am a citizen of the world, I fly hundreds of thousands of miles every year. I’ve been to 138 countries and every US state. But I always return to Nebraska, it's the best place on earth. It's home. There is no better place than Nebraska to make photographs. The light. The diverse topography. That big sky. The open, friendly people. The cranes are ancient, magnificent creatures. Watching them fill the skies, their sounds dominating the early morning and late afternoon heavens, is breathtaking. I’m comfortable saying that being on this piece of sand, in the middle of the first river I knew, on a bitter March night, drenched to the bone was one of the most magnificent experiences I’ve enjoyed in nature. Having been a photographer for most of my life, I've always had an interest in photographers and artists who are very good at what they do. I've been involved with various photographic workshops and conferences over the years and was tasked with finding a keynote speaker for a workshop in Hastings a number of years ago. My research indicated that Bill Frakes — Sports Illustrated photographer and senior staff photographer for Time Inc. — had an interest in Nebraska. The workshop had little in the way of funds to work with to get Frakes here, but I reached out to him by email to see if he would do it. 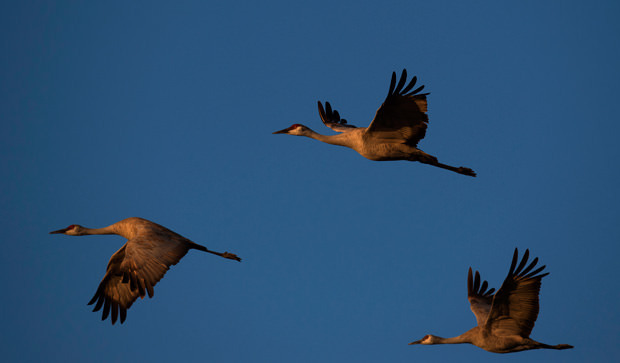 He arrived in central Nebraska for the workshop in February and the cranes were on the verge of showing up. He told me that he would be interested in coming back to the Grand Island area to create a short film on the sandhill crane’s annual spring migration. 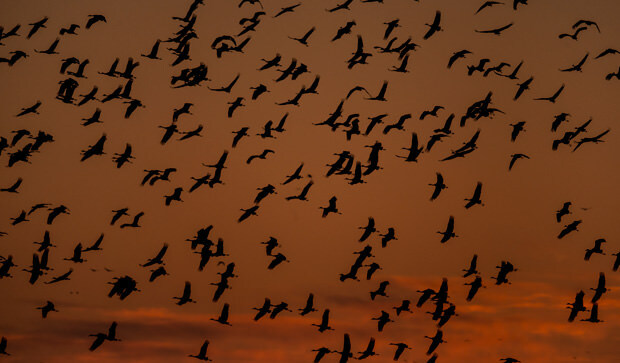 A plan for him to come back and film the birds was established, and a few years later he returned to the Platte River Valley for the first of many visits to capture the crane migration in his style. That was one of the top five nights of my life. Frake's style is based on a career of shooting still photography that is world class in its scope. Michael Jordan? Check. Manning brothers? Not a problem. Kentucky Derby? Every year. 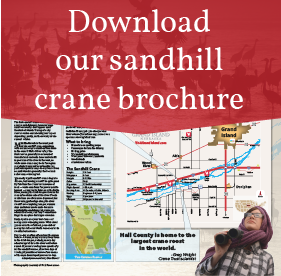 So why is it that he's drawn to Nebraska's sandhill crane migration? It's big and loud and unique. Bill grew up on a ranch near Scottsbluff and still has a place of his own out west. When it comes to Nebraska, the stories and memories run deep; it's a part of his DNA. My previous position as director of the Crane Trust Nature & Visitor Center proved helpful Frakes film the sandhill cranes, and we spent countless hours on the piece, finding locations and getting permission to shoot. The Crane Trust, private landowners and the Platte River recovery program were extremely helpful in finding these places to film. It was a long week, starting most days at 4am and getting to bed many times after 11pm. I learned a lot about how Frakes and his team work; the array of equipment they use is amazing. Their camera bag is a minivan, full of Nikon goodness. It's difficult to get all of Frakes still and video equipment onto location without disturbing the birds, and it was imperative that we do it right and not disturb them in any way. That meant using established blinds. We set up a blind on a sandbar in the braided Platte River, which meant hauling hundreds of pounds of gear worth tens of thousands of dollars through river wearing wading boots. Frakes had a high-end camera over his shoulder as we crossed the wide and shallow Platte when he stepped into a hole. One of the hip-high wading boots filled with water, almost causing him to fall all the way in. With little time before the birds would return to the sandbars from their foraging in corn fields, he decided there wasn’t time to come back and change into dry clothes and spent the entire night in the viewing blind with wet pants — a cold night for sure. I returned the next morning to fetch him and he schlogged his way to through the water back to shore. Still standing in the water, frozen, wet and exhausted, he looked at me and said, "that was one of the top five nights of my life." 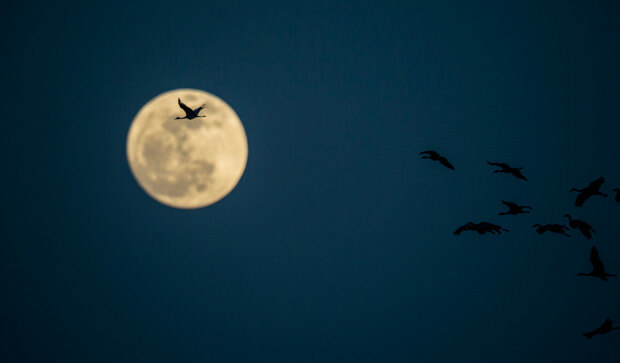 These majestic birds create a city on the sandbars and bustling traffic in the skies. I’m not sure if he even got the shot he was after that night, but just the experience was enough to keep him coming back to this world-class wildlife migration. Frakes’ short film documenting his experience with the sandhill cranes was produced over two years with a cinematic approach including both time-lapse and cameras that produce amazing slow motion. His innovative production style and dedication to quality resulted in a timeless piece that has found audiences in Nebraska and around the world. 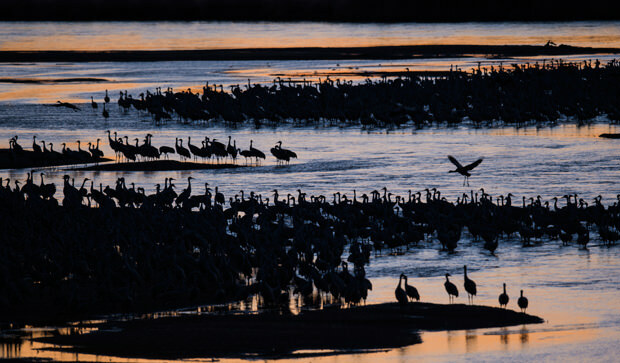 Large audiences in the Far East have now had an opportunity to experience the sandhill crane migration of Nebraska in an artistic and beautiful new way. Frakes has been a fantastic partner of the Grand Island Convention & Visitors Bureau as well as the Nebraska Tourism Commission. The film I helped him produce can be viewed here. Frakes, along with his longtime assistant and business partner Laura Heald, are real pros with great stories, always a cup of coffee in hand, and a great sense of humor. An award-winning director and photographer, Frakes has worked in all 50 states and in more than 138 countries for a wide variety of clients including Apple, Nike, Coca-Cola, Nikon, and Reebok. 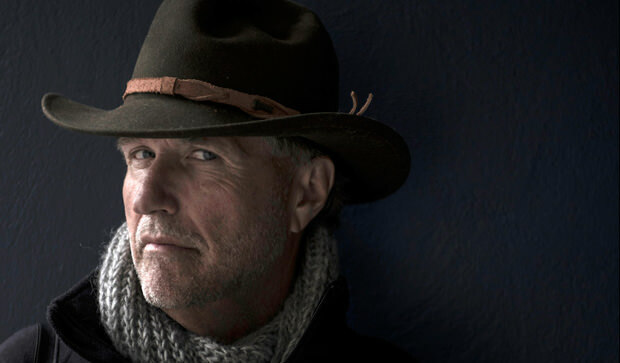 His editorial work has appeared in virtually every major general interest publication in the world, and his still photographs and short documentary films have been featured on hundreds of websites and most major television networks. He has taught at the universities of Miami, Florida, and Kansas as an adjunct professor and lecturer. During the last five years, he has lectured at more than 100 universities discussing multimedia and photojournalism. I am a citizen of the world, I fly hundreds of thousands of miles every year. I've been to 138 countries and every US state. But I always return to Nebraska, it's the best place on earth. It's home. 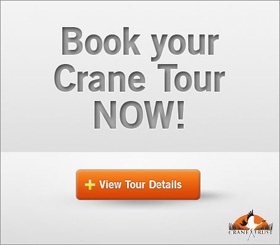 Guided viewing blind tours are designed to get you as close to the cranes as possible without disturbing them. Following a brief orientation at the nature center, you’ll head to the blinds or footbridge to observe the cranes for approximately two hours. The viewing blinds are enclosed, unheated structures along the main channel of the Platte River. After driving your own vehicles to a staging area, a short hike (1/2 mile or less) over moderatly rough terrain will take you to the viewing blinds. Participants come and go as a group so as to minimize disturbance. Blind tours are offered to people age 12 and up, both morning and evening, corresponding to when the birds leave and enter the river. Footbridge tours overlook a smaller channel of the Platte River about a 1/3 mile from the nature center. These handicapped-accessible tours are offered weekend evenings only. 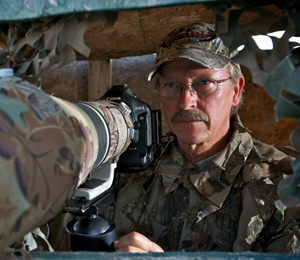 Rick Rasmussen runs his grandfather's tire shop most days, but his passion is nature photography. 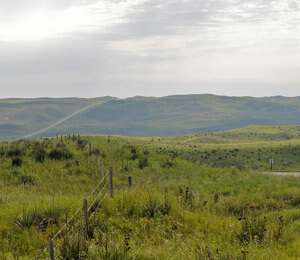 The northern grasslands, including the ecologically unique Sandhills, are as important as places like the Amazon in terms of conservation. 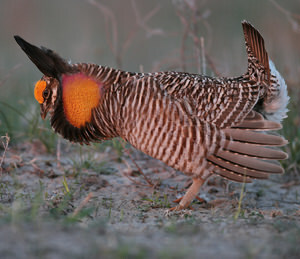 The booming of the Prairie Chickens follows on the heels of the crane migration and is becoming more and more popular.